JIRA software follows agile methodology but here we need to understand first what is agile model actually means. Project management can be done by following agile method. Agile model contain many stages for managing whole software application. We can see this in image. As we can see that here each stage is depended with each other. Agile model is the Incremental type model. It indicates that we can divide whole project in small parts and we can give release for that parts and then we can merge whole application with perfection. Software requirements should be the first stage and it is quite obvious. First we need to collect all the requirements of the client and prepare list of all the functionality which we need to develop. We can analyze project by deciding the software development hours , by testing hours , how much time should be spent in writing documents , whom should assign this project. How we can estimate the project? This all questions are discuses in this analyze phase. In this stage , Team decide about the design whole software project. Which type of layout should be suitable more in the project? Which color should be more attractive for customers as they can willingly use this application? This all the discussion have been done in this phase of the agile model. We need to develop the software application so codding is playing important role here. We need do develop optimist coding which will create less errors in projects. In this phase team is doing this task. QA people test the software application for improving quality of the product. They posting issues and changes for the application and making then more usable. This is the last phase of the agile model as here application needs to develop after wards Testers can test whole application. JIRA is tracking this in very well manner. Acceptance simply indicates that all the issues have been verified by the developers and released to QA people so they can start testing on it and declare it as it is error free. Thus, small parts of the application can be done perfectly here. Team can release small part of the big project and then they can move to the next part and by following this method at the end we can release whole well developed and tested project without any error. Even plus point is, if client need any changes in middle of the application then he can easily communicate with the team and team can develop it. Here if water fall model is applied then , Team will be informed at the end of the project development. This is the best advantage of agile methodology. Only drawback of this model is , If project have not been divide in well manner then it will be big trouble for a team. So when we use agile methodology then experienced person should have all rights to take decision. This is all about Agile meteorology. Now we will learn how JIRA followed it. First of all we need to create a Project with all the requirements which have been approved by client. After creation of the project , Project manager assign task to the Team. Analysis process have been take place here so Team needs to work upon it. Then Design of the project have been finalized and approved by the client. Then Development Process can take place and in between if they are found any issues for the application then they can create an issue with the assigned project. After development , Tester team start their work for testing the application from top to bottom.They verified all the possible scenarios and done all the possible integration scenarios for checking the application with positive and negative testing. In this between if they fond any issue then they can post it with 'Issue Type' and Priority of the issue. It indicates that if tester find any bug on enhancement then they can post it with suitable priority. For ex. If application got hanged then he needs to post issue in 'Bug' issue type and it must have priority as 'Blocker' because it generates exception and stops the application. We can derive same scenario for medium and low Priority issue. Tester can create the issues and found vulnerability of the application and developers need to solve it. 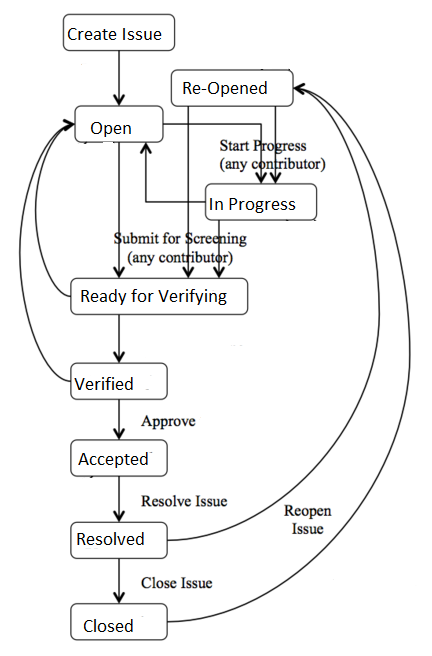 First when tester post issue then it has 'Open' status then developer starts solving it and mark issue as 'In Progress' then he stops progress and mark issue as 'Done' and then he can mark issue with 'Resolved' status. 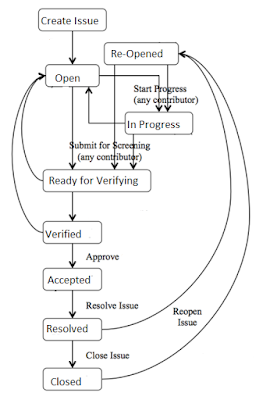 After wards Tester need to verify it and mark that issue as 'In Progress' and if they confident about the issue that it was solved and from now it will not harm the application then he can mark it with 'Closed' status. But if QA people feels that issue have not been solved then they can mark 'Reopen' status for that particular issue and developer needs to solve it. Then QA people again verify it and then they will close it with all the verification. After this all , we can create reports for all the procedure so we can take estimation properly. If we need to change some functionality of the application then we can implement it in the middle stage. After wards all the stage have been followed so at the End Project will delivered successfully. 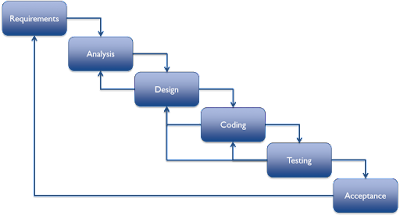 This the whole procedure of JIRA which is followed agile methodology.